Weddings are certainly special events. Unlike other celebrations, they adopt and embrace bridal traditions that go back centuries. Each traditional element helping to make the day feel unique. It can also be a little daunting though! The area of wedding traditions is one that always raises questions when I talk to Barton Grange Hotel brides and grooms. ‘Do we have to?’ is often what I hear. Sometimes the traditions can feel out of date, and yet for others, are essential. The question of refreshing wedding traditions is certainly up for debate. The traditional wedding photograph has changed. We no longer see as many staged photographs, with couples opting for more relaxed reportage type shots that reflect the personality of the day. Photo booths are also popular. Any staged photographs tend to be more adventurous, and a lot are taken outside in our Walled Garden. Even when it rains we incorporate umbrellas and wedding wellington boots into shots! This is still high on couples wish list for their day. Cake designers have transformed the wedding market. 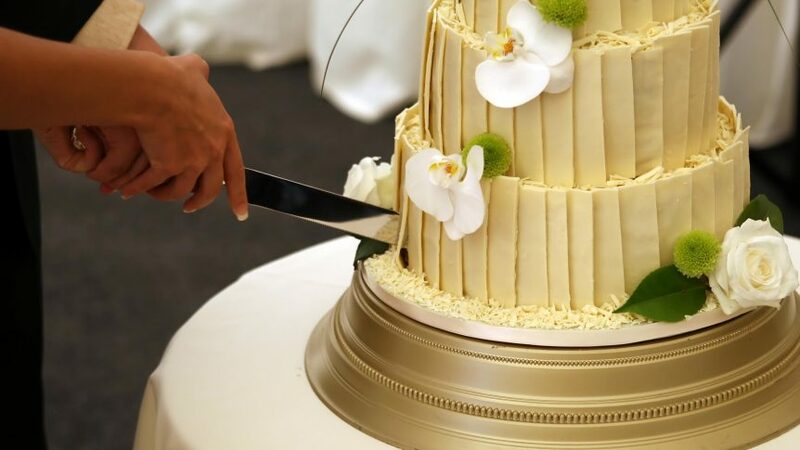 Many couples who are refreshing wedding traditions with their own take on the big day, now prefer towers of bright cupcakes or doughnuts, and savoury or naked cakes as their wedding cake. The fruit-based cake has been replaced by sponges of all flavour, with the tradition of saving layers of cake for your children’s christening being a thing of the past. The cake is now more about a lovely photo moment and a sweet treat for guests. Most modern couples are missing this tradition as they want to stay to the end of the party, not drift away early. Lots of couples also have a couple of days at home before heading off on honeymoon, so the tradition of waving them off as they leave for their trip is a bit defunct. I still see brides ‘throwing the bouquet’ as a lovely fun photo moment. They don’t buy-into the belief that the lady who catches the bouquet is next to walk up the aisle, but it can be fun to work into the big day. We often see it done just before the brides heads off to change outfits for the evening. It brings the formal part of the wedding to a close, before the party begins. You’d be surprised just how popular this tradition still is, and an easy one to include. All the different elements are now brought into the day in modern ways. From vintage wedding dresses to new shoes, borrowed jewellery and delicate blue flowers in bouquets and table displays.